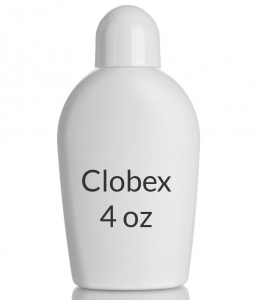 USES: Clobetasol is used in adults to treat moderate to severe scalp psoriasis. Clobetasol reduces the swelling, itching and redness that can occur with this condition. This medication is a very strong (super-high-potency) corticosteroid. This medication is not recommended for use in children or those less than 18 years of age due to an increased risk of side effects. Consult your doctor or pharmacist for details. HOW TO USE: Read the Patient Information Leaflet provided by your pharmacist before you start using clobetasol shampoo and each time you get a refill. If you have any questions regarding the information, consult your doctor or pharmacist. This shampoo should be used only on the scalp. Avoid contact with the eyes, nose and mouth. Do not bandage, wrap or cover the affected area (e.g., avoid using shower caps or bathing caps) unless directed by your doctor. Apply a thin film of shampoo to your dry scalp by squeezing the bottle directly over the affected area, once daily, or as directed by your doctor. Gently rub the shampoo into the affected area, leaving it on your scalp for 15 minutes. Wash your hands immediately after applying the shampoo. Then wet your scalp, lather, and rinse the shampoo off thoroughly. Also rinse any other body parts (e.g., hands, face, neck, shoulders) that may have come in contact with the shampoo. The use of another non-medicated shampoo is not necessary to clean your hair, although it may be used if desired. Do not apply this medication to your face, neck, groin, or underarms. Avoid using this medication close to the eyes or lips. Getting it in the eyes may worsen or cause glaucoma. If you get the shampoo in your eyes or on your lips, rinse thoroughly with plenty of water. Do not use this medication more often or for a longer period than prescribed because the risk of side effects may be increased. Do not use more than 50 milliliters (1.75 ounces) of shampoo per week. Treatment with this medication should be limited to 4 weeks. If your condition does not improve within 4 weeks, contact your doctor. SIDE EFFECTS: Burning, stinging, itching, irritation, redness, discoloration, dry skin, hair loss, headache, or acne may occur when this medication is first applied to the scalp. This should disappear in a few days as your body adjusts to the medication. If any of these effects persist or worsen, notify your doctor or pharmacist promptly. Remember that your doctor has prescribed this medication because he or she has judged that the benefit to you is greater than the risk of side effects. Many people using this medication do not have serious side effects. Tell your doctor immediately if any of these unlikely but serious side effects occur: stretch marks (striae), skin thinning/discoloration, excessive hair growth, hair bumps (folliculitis). Skin infections can become worse when using this medication. Notify your doctor if redness, swelling or irritation does not improve. Rarely, it is possible this medication will be absorbed from the skin into the bloodstream. This can lead to side effects of too much corticosteroid. These side effects are more likely in children, and in people who use this medication for a long time or over large areas of the skin. Tell your doctor right away if any of the following side effects occur: unusual/extreme tiredness, weight loss, headache, swelling ankles/feet, increased thirst/urination, vision problems. A very serious allergic reaction to this drug is unlikely, but seek immediate medical attention if it occurs. Symptoms of a serious allergic reaction may include: rash, itching/swelling (especially of the face/tongue/throat), severe dizziness, trouble breathing. This is not a complete list of possible side effects. If you notice other effects not listed above, contact your doctor or pharmacist. In the US - Call your doctor for medical advice about side effects. You may report side effects to FDA at 1-800-FDA-1088. In Canada - Call your doctor for medical advice about side effects. You may report side effects to Health Canada at 1-866-234-2345. PRECAUTIONS: Before using clobetasol, tell your doctor or pharmacist if you are allergic to it; or to any other steroids (e.g., hydrocortisone, dexamethasone); or if you have any other allergies. This product may contain inactive ingredients, which can cause allergic reactions or other problems. Talk to your pharmacist for more details. Before using this medication, tell your doctor or pharmacist your medical history, especially of: poor blood circulation, diabetes, other skin/scalp conditions (e.g., rosacea, perioral dermatitis), immune system problems. Do not use if there is an infection or sore in the area to be treated. Rarely, using corticosteroid medications for a long time or over large areas of skin can make it more difficult for your body to respond to physical stress. Therefore, before having surgery or emergency treatment, or if you get a serious illness/injury, tell your doctor or dentist that you are using this medication or have used this medication within the past few months. Though it is unlikely, this medication may slow down a child's growth if used for a long time. The effect on final adult height is unknown. See the doctor regularly so your child's height can be checked. This medication should be used only when clearly needed during pregnancy. Discuss the risks and benefits with your doctor. It is not known whether this drug passes into breast milk when applied to the scalp/skin. Similar medications pass into breast milk when taken by mouth. Consult your doctor before breast-feeding. DRUG INTERACTIONS: Your healthcare professional (e.g., doctor or pharmacist) may already be aware of any possible drug interactions and may be monitoring you for it. Do not start, stop or change the dosage of any medicine before checking with them first. Before using this medication, tell your doctor or pharmacist of all prescription and nonprescription/herbal products you may use, especially of: oral corticosteroids (e.g., prednisone), drugs that suppress the immune system (e.g., cyclosporine). This document does not contain all possible interactions. Therefore, before using this product, tell your doctor or pharmacist of all the products you use. Keep a list of all your medications with you, and share the list with your doctor and pharmacist. NOTES: Do not share this medication with others. This medication has been prescribed for your current condition only. Do not use it later for other skin problems unless told to do so by your doctor. A different medication may be necessary in those cases. Laboratory and/or medical tests (such as adrenal gland function tests) may be performed periodically to monitor your progress or check for side effects, especially if you use this drug for an extended period of time or apply it over large areas of the body. Consult your doctor for more details. Inform all your doctors you use or have used this medication. STORAGE: Store the US product at room temperature between 68-77 degrees F (20-25 degrees C) away from light and moisture in a tightly closed container. Store the Canadian product at room temperature 59 to 86 degrees F (15 to 30 degrees C) away from light and moisture in a tightly closed container. Do not store in the bathroom. Keep all medicines away from children and pets. Do not flush medications down the toilet or pour them into a drain unless instructed to do so. Properly discard this product when it is expired or no longer needed. Consult your pharmacist or local waste disposal company for more details about how to safely discard your product.